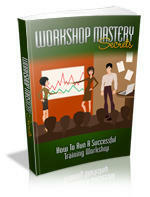 Get all the support and guidance you need to put together killer workshops and finally be the success you want to be! This book is one of the most valuable resources in the world when it comes to how to run a successful training workshop. However... you may not have all the info you need to make this happen! You know that your lack of knowledge on putting together good training workshops is making your success difficult... maybe even impossible?